Grandson of Canadian homesteaders, Richard grew up on rustic, mixed farms in a multicultural community in Saskatchewan, Canada. Moving to Portland, Oregon in 1959, he completed college in electronics engineering, married Ruth and reared three daughters. For the next 34 years, Richard served in varied bi-vocational roles. For the electronics industry, he engineered military and commercial products, managed many engineering projects, developmental programs, and a department, and providing consulting services to NW USA companies. In a faith community, he volunteered musical, publication, speaking and leadership services, and served on a committee that enabled international workers. 1989-1998, Richard and Ruth also studied part-time, Richard earning a Masters and a doctoral degree in intercultural studies. During the studies, they also gathered a base group to support and assist the launch of a holistic initiative to several Central Asian peoples. In 1998, Richard was asked to direct an agency’s community transformation and mentoring functions. These roles opened doors to relationships with community transformation agents; and to enlarge his understanding and application of the servant mindset, bi-vocational service and community transformation concepts. By 2001, Richard’s life experience and training had prepared him to lead the launch of Community Vision International (CVI²). Ruth assists Richard who now co-directs Community Vision International. They also manage a service, which develops, utilizes and offers diagnostic-equipping and media resources to guide, transform and equip community servants and transformation agents. This work in turn provides Ruth other service opportunities, e.g. : intercession for clients, transformation workers and others; and selection, recommendation and distribution of life-building media. 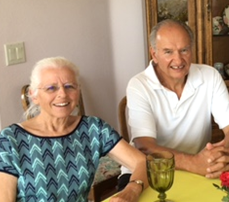 Ruth and Richard are now grandparents of 11, and great grandparents of two grandsons.